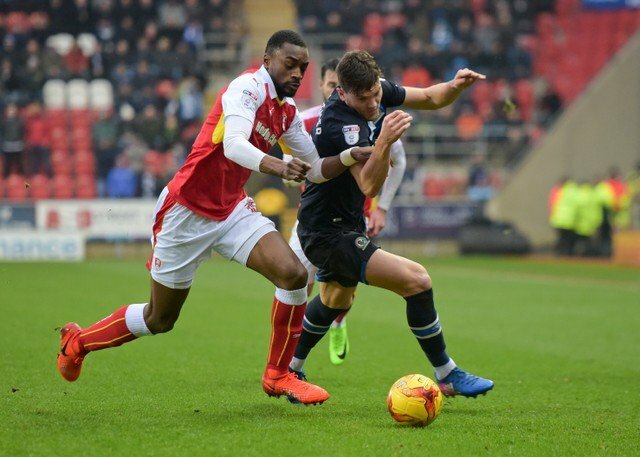 Rotherham United held on to the last five minutes to what looked like a well earned point against Leeds United at the New York Stadium this afternoon but a defensive mistake on eighty-six minutes gave the league leaders all three points. The game began with a minutes silence in support for Emiliano Sala, David Ibbotson, their families and friends and Cardiff City Football Club. The Millers might have gone in front within the first minute when a Anthony Forde was left in a lot of space some thirty yards from goal but his effort went wide. At the other end Jack Harrison put a good ball across goal towards Kemar Roofe who headed towards goal but Joe Mattock was there to hack it away. On five minutes the Millers were awarded a free-kick which Forde did well with making Leeds debutante ‘keeper Kiko Casilla punch clear before a super run from Mattock saw the ball end up with Jon Taylor who sent a ball in towards Michael Smith who was penalised when his marker was all over him. The Millers striker Smith did well at the other end when he got to a Harrison corner before a visiting player and minutes later when a Pablo Hernandez free-kick the tall striker was there again to clear. Just before the half-hour mark some superb passing started by Semi Ajayi and involved Mattock, Forde and Richie Towell coming back to Ajayi twenty-five yards out who let fly and was rewarded with what looks like being the goal of the season when it flew into the top corner of the net to give the hosts the lead. At the other end Clark Robertson did well to keep out a shot from Hernandez and minutes later Billy Jones did well to head a lovely ball in from Luke Ayling away before it reached Jack Clarke. In the final minute of the half some good work from Leeds saw Roofe get the ball to Harrison but Millers’ ‘keeper Marek Rodak did well to get down and smother it. The visitors started the second half by fetching on Tyler Roberts for Jack Clarke. The half was a couple of minutes old when Michael Smith found Will Vaulks on his own and the Millers skipper shot from just outside the box but Mateusz Klich did well to block before a cross from Joe Mattock was headed just over his own crossbar by a visiting defender. An Anthony Forde cross found the head of Sean Raggett but the tall defender put the ball wide. Six minutes of the half had gone when Leeds got back into the game after a cross from Pablo Hernandez saw both Raggett and Klich go for it with the Polish midfielder sticking out a leg and putting it just over the line. It was all Leeds after that with Marek Rodak managing to catch a looping header from Kalvin Phillips before Klich tried his luck from the edge of the box which the Millers managed to scramble away. On the sixty-third minutes the Rotherham fans were out of their seats when Vaulks got the ball twenty-five yards out and let fly only for Kiko Casilla to fetch off a brilliant one handed save to tip the ball round the post. From the resulting Forde corner Clark Robertson headed straight at the Spanish ‘keeper before Rodak was in action at the other end when he did well to get to a shot from Hernandez. Kemar Roofe had a chance but managed to put his header wide when it looked easier to score followed by Harrison finding Ezgjan Alioski who was in acres of space but he managed to put his shot wide. With fifteen minutes to go the Millers brought on Jerry Yates for Jon Taylor. Vaulks did well to get the better of Klich and take the ball from him which was followed by the first yellow of the afternoon which went to Robertson after Roofe fell over in front of him. Rotherham then made another substitute fetching Kyle Vassell on for Michael Smith. A superb challenge saw Raggett dispossess Roofe in front of goal which was followed by Matt Crooks coming on for Richie Towell. A minute later Leeds took the lead when Harrison sent in a lovely ball for Klich who had far too much room and shot the ball into the corner of the net. This was Harrison’s last action as he was subbed by Jamie Shackleton. The Millers tried to get back into the game with Kiko Casilla getting a yellow for time wasting, although he then continued to time waste with nothing being said, and minutes later he flapped at a cross from Vaulks but the ball went to safety. Leif Davis replaced Pablo Hernández for the visitors and Kalvin Phillips saw yellow for a poor challenge on Vassell. Forde took the resulting free-kick with Marek Rodak coming up for it but it was scrambled to safety by Leeds. I was disappointed this afternoon because I felt the Millers deserved a point and played a lot better than last week.